i want to buy a lg g4, but i am reading some reviews saying that the lg g4 battery is bad and the s6 has a better battery life, any g4 user can help me with his battery life experience ? Most reviews of the day the LG's battery lasts somewhat longer for what it's worth. That includes long term reviews. By contrast, most reviews and user reviews of the States saying it's smaller battery (which offers a processor that requires more juice) is the single biggest drawback of the device. I'm currently trying out a G4 and can stay to its battery life laying me the whole day and I use my phone a lot. But I don't have an S6 to compare with. If the G4 had built in wireless charging, I guess you wouldn't have to ask given that it already has a replaceable battery. The above should read "Most reviewers say"
I have one of them 😌 and i think g4 is the best for now. Because ips q screen. Forget who Gidelim "ooh battery is low". Don't care them. It's pretty cool. And the screen... Just amazing. By the way battery is pretty good too. Battery laying me whole day and i use my phone really a lot. I think you need to tweak this phone (like any other) to get the most out of it. I disabled a lot of apps that came from VZ, and also Google which were sucking my battery dry (Hangouts, Chrome). Last night I went to bed with 15% remaining, 4.5 hours of screen time, 1:45 talk time and some of that in bad areas with poor coverage. The first few days I didn't even make it past 6:00pm before it ran out of battery. I'm not a power user though, no games, no social stuff (Facebook, Twitter), mostly surfing/text/weather/phone/email/calculator/calendar. Having used both devices, for my uses they are pretty similar in battery life. Ymmv of course. The only day I had poor battery performance was the first day I had my G4. That was primarily due to me using it almost non-stop along with installing and tweaking it to my tastes (with tons of apps running). I have been using it quite a bit since then in this first week I've owned it, and now getting over 6hrs of screen on time. When I settle into a more routine usage cycle, I expect greater duration for it, due to lighter use. However, I count myself as more than impressed with its battery endurance. All this when pretty much using LTE full time. I still haven't used its battery saving mode or even something like Juice Defender. 3-4 hours on screen. Great phone but battery is just OK. 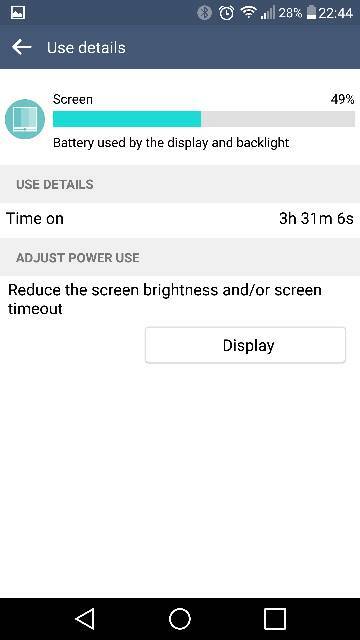 Note 4 got me about 2.5 hours of SOT. Nexus 6 gets me around 2-3.5 hours of SOT. My G4 is on its way Let's see! hehe. 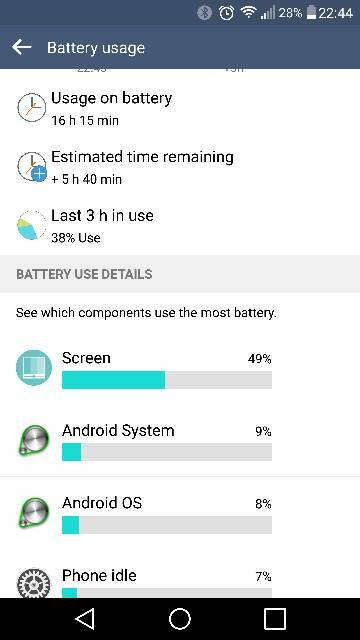 Only my 2nd day, still have 28% left, happy with 3.5 hours screen time so far, should get another hour of screen time out of it before I charge it. Yeah I'm exactly the same way. My services are all Microsoft stuff so I killed most of the google stuff right out of the box and my battery life is pretty great. Exactly the same for me... first day it did poorly but I was using it constantly. I'm usually at about 20% when I recharge and my screen time is avg 3 hours 20 minutes, so I could likely get to 4 hours if I drained. The standby usage is amazing. If that's the case then maybe you'll get like 2 to 3 hours. Good luck! Great phone but I haven't quite figured out Android configuration coming from iOS. It'd just not as good even with much better specs. I'm sure you'll figure it out quickly. There are many launchers. You can change themes and icon packs. You can change keyboards. You'll very much enjoy Android. Hehe. It's killer on mine, off the charger I lose maybe 3% overnight. Wow... I lose about 2%-5% an hour on my N6 ... Even when rooted, running amplify, a custom kernel and greenify... I love my N6, but for the lack of battery life and the slow to focus camera... Hmm... Maybe all of these manufacturers have a pact to not put out the perfect device! haha. G4 offers size and camera. Galaxy S6E offers camera and style. Nexus 6 offers huge screen and front facing speakers. Note 4 offers nice screen and s-pen. HTC M9/+ offers premium build and awesome sound. Xperia Z3+/Z4 offers waterproofing and beautiful design (in my opinion) as well as FFS. I hope the G4 is my device! I've had so many this year! Mine's pretty nice. I don't have an S6 to compare though. For my needs, the G4 has plenty of battery power. At my house I have great reception and strong wifi, so that definitely makes a difference. Oh. I sleep with it in airplane mode. Haha. If reception is good, battery life is good. One of my favourite things about this phone is the standby time; with my old Note2, I knew that when I hit 30% I had either better find a charger or else put it in battery-saving mode with brightness turned down to 10% -- otherwise the battery was going to be dead for when I next wanted to use it. On this phone, when it hits 30%, it's going to stay around that for a long time to come. ectoren and zkyevolved like this. 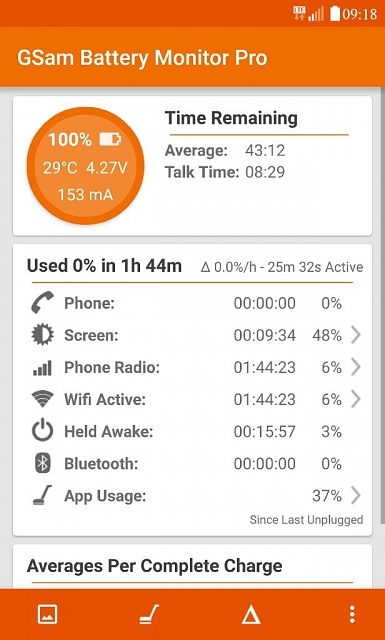 I have gone over 31 hours standby, with just under 5 hours SOT, and still had 20% battery left! This phone has AMAZING standby battery life!! zkyevolved and sswitzer like this. Why my battery is not getting charged instead of plugging in and switching it on?